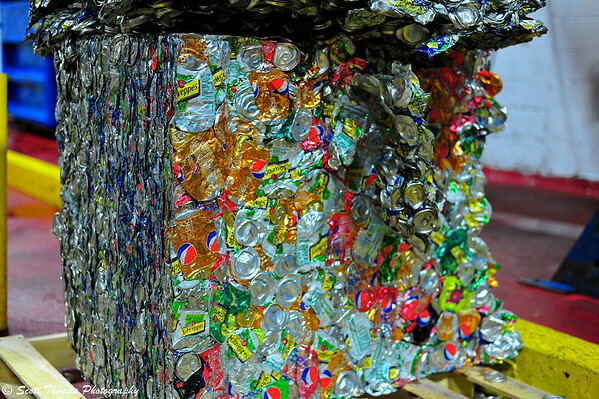 Rejected soda cans crushed into a brick for recycling. Nikon D700/50mm, 1/60s, f/3.2, ISO 800, EV +0.3. During a lunch break at work, I wandered around the plant and came upon a brick of metal cans from rejected sodas ready to be sent to the recycling facility. In the past, I would have not given the brick a second glance. However, remembering my goal to work on seeing photographic opportunities, I went over to the brick (pictured below) and found various compositions using recognizable brands. The photo I selected for my first post on the Art of Seeing is anchored by Pepsi and Mountain Dew cans floating on a sea of mangled metal. Taking the photo using the Nifty Fifty, Nikon 50mm f/1.8D lens, allowed a shallow depth of field to separate the cans from very busy back and foregrounds. I processed the photo in Aperture 3 by first applying the Toy Camera preset to saturate the colors and add a vignette. I recovered all the highlights using the Recovery slider which brought out the metallic texture. A brick of metal soda cans ready to be recycled. This entry was posted in Photography and tagged 50mm, aperture 3, brick, cans, crushed, metal, mountain dew, nifty fifty, nikon D700, pepsi, preset, recycling, rejected, toy camera. Bookmark the permalink. Cool! I’d like to get my hands on that brick for a photo session! What a cool find and opportunity to do something different! I really like the first shot. Oh my, when I saw the title of this post on Twitter, I thought maybe something bad had happened with your cruise! LOL! 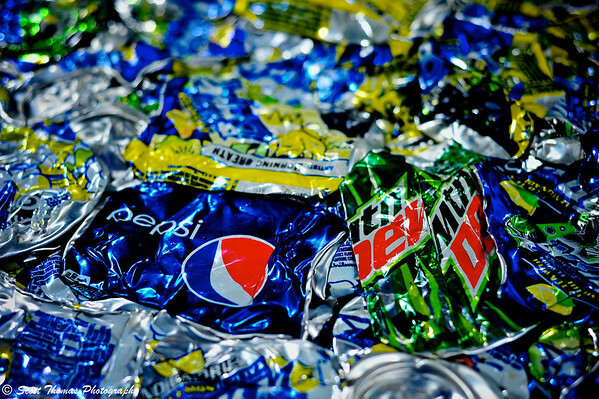 Nice top photo…that pop of green from the Mountain Dew is fantastic! Way to spot opportunity, Scott! There’s a different way of looking at pretty much everything, isn’t there! Excellent not to let this opportunity go by unnoticed! I think there are great photos in just about any unusual or colorful or odd thing. Just takes a little looking. Modern art on recycling. A great find and capture, Scott. I like the vibrant colors, the 50mm lens creates a nice shallow depth of field. It’s probably not as scary looking to carry around also.